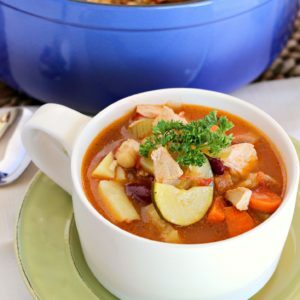 This Turkey Vegetable Soup is the perfect way to use up all that left over turkey you have from your Thanksgiving meal. It’s also very easy to throw together, so you won’t have to be in the kitchen another minute! 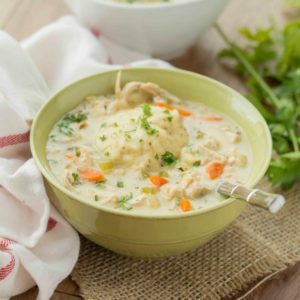 I realize I just recently posted a soup recipe, but with Thanksgiving a day away, I wanted to share a recipe where you could use up that left over turkey. I also wanted the recipe to be easy to throw together because I know you’ll be in the kitchen for 15 hours. Okay maybe not that long, but doesn’t it feel like it at the time? I love being in the kitchen, but thanksgiving day is one of those days that I feel like I never leave. And don’t even get me started on the dishes. Man there are so many. This year we’re having a smaller Thanksgiving. Just my family of 4 and my parents. Normally we have my sister and her family, then the grandparents. I love the big gatherings. I love hearing the kids laughing, my dad yelling at the tv because some sort of football game is on, then my mom, sister and I just hanging out in the kitchen gossiping. That’s what thanksgiving is about. It is also about the food, but hanging out and laughing with the family is the best part. 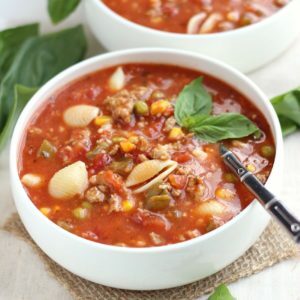 This soup recipe uses most of the vegetables that you probably already have on hand from all of your Thanksgiving cooking, so you don’t need to go out and get more. 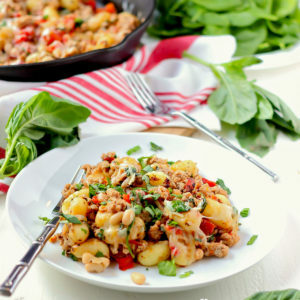 It also uses a couple of cans of beans, then add your turkey and wha-la you have yourself this awesome dinner! I recommend making this soup earlier in the day. I’ve noticed the longer the soup sits, the better it tastes. I normally try to make it around 3:00ish or so. Then just let it sit until your ready to eat. I realize that all of you can’t do that, and that’s okay. It will still taste just as amazing. Promise. So if you’re as tired as I am and in need of using up all that left over turkey, then get in the kitchen and whip this together. Your gonna love it and be in and out in no time at all. 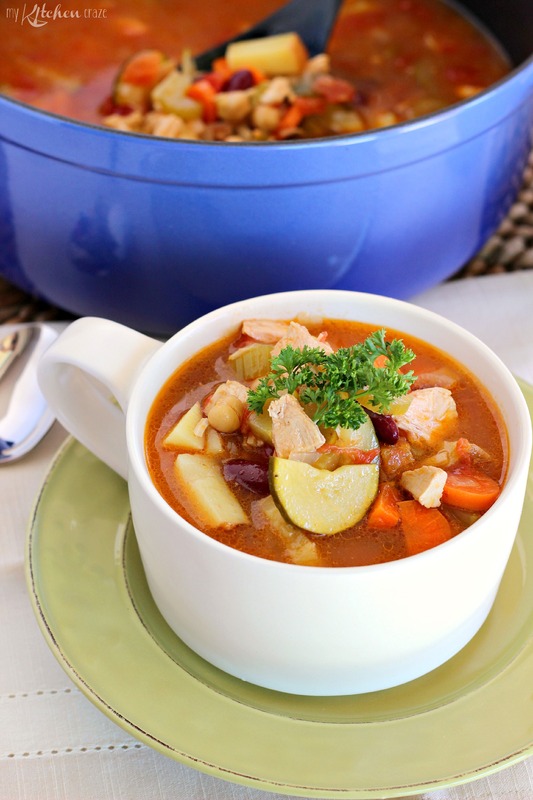 In a dutch oven or large soup pot, add olive oil and heat on medium-high heat. Once piping hot; add the onion, potatoes, celery, carrots, bay leaves, zucchini and squash. Cook for 8 minutes; stirring occasionally. Stir in Old Bay seasoning and cook 1 minute. Add in kidney beans, garbanzo beans, petite tomatoes, chicken broth, salt, pepper and turkey meat. Stir to combine. Add in tabasco sauce, Worcestershire sauce and stir to mix all ingredients together. Cover and simmer soup for 15-20 minutes on low heat. Discard bay leaves before serving. 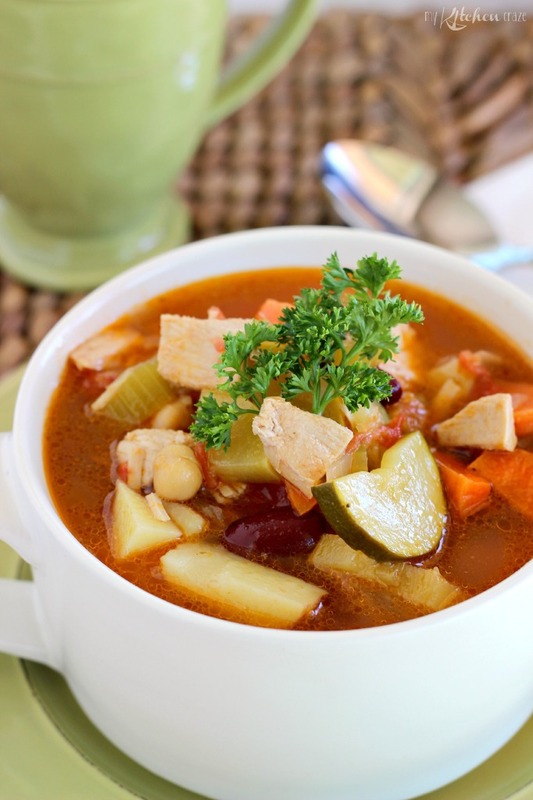 I LOVE soup — it’s such a great way to use up all kinds of leftovers! Being with family and friends is my favorite part about Thanksgiving too, all the food is just an added bonus! 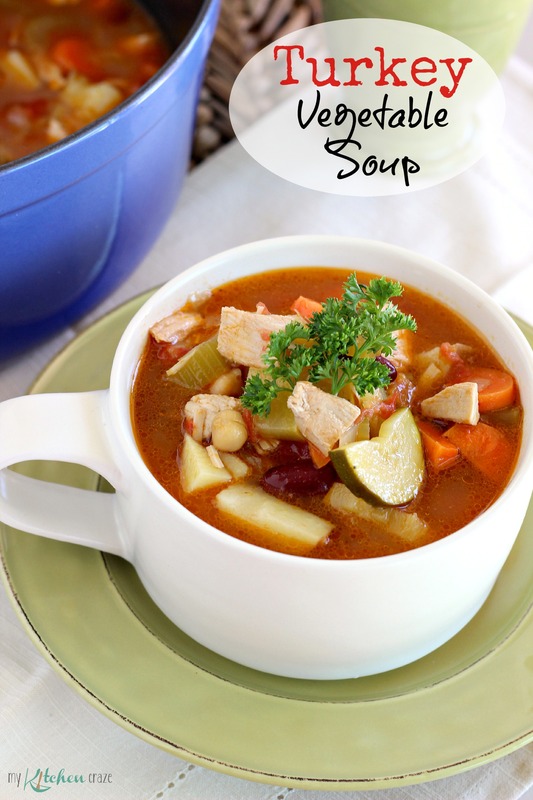 This soup looks delicious and perfect to make the day after Thanksgiving!